The Senior Address at Commencement, as delivered by Thomas Holmberg of Winnetka, Ill.
Good morning, Bates. Around this time every year, I have written letters — dozens of letters — to friends of mine, seniors who are moving on from Bates. Let me tell you about my process. I go to Facebook, I click “show friendship history,” I put Green Day’s “Time of Your Life” on repeat and I get to work. These are love letters to people that have touched my life profoundly, thanking them for the guidance, and the good times and to say goodbye for now. 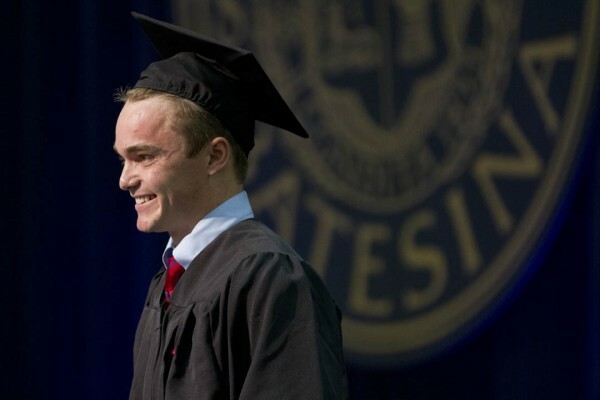 “Luckily for me, I have this very special opportunity to speak before you today and deliver my love letter to you, Bates College,” said Thomas Holmberg in his Senior Address. Photograph by Phyllis Graber Jensen. Well, looking into the crowd, I see hundreds of people that I’d love to write to before I go. My classmates, the teachers, and staff who’ve taken such good care of us and everyone we’re leaving behind. That’s a lot of letters. Luckily for me, I have this very special opportunity to speak before you today and deliver my love letter to you, Bates College. And that might be just something to say — but it’s not. There’s something magic about this little chunk of Lewiston, Maine. Every inch of it is so full of goodness and memories. Every inch. Teachers, we thank you — for the education. But Bates educates the whole person — all aspects — and it starts right away. AESOP sends us out into the woods with a group of strangers. We cook mac and cheese around a campfire with kids from all around the country and all around the world. We climb mountains and ford rivers and we cram side by side into lean-tos with the mice. We wake up in strange places and we see beautiful things and we come back with the Bates mindset. That we’re all in this together. Like we’re all cutting a hole in the middle of a frozen lake and jumping in, metaphorically speaking. Then we joined teams, and so many upperclassmen mentors helped us along. We were lost and they gave us a family. We weren’t cool, and they made us cool. And I wondered, as a freshman, why these older kids were so good to us, so invested in our happiness here. I know why now. We emulated those older kids, they gave us an ideal to strive for. And then we blinked and we were the upperclassmen and there were a crop of new kids wearing their ID’s on lanyards around their necks. And we knew it was our duty to provide for them the Bates experience we cherished so much. You see, it’s a beautiful cycle. The goodness of Bates is passed on out of admiration and gratitude for what was and excitement and pride for what will be. Freshmen come in, and I like to ask them, “What is your dream?” Because Bates is a place where all your dreams can come true. And that is a fact. There is a club for you, there is an opportunity and there is an avenue for you to realize that dream. There is a professor with the passion to inspire you to new academic heights. I am so genuinely excited when I meet prospective students. I tell them that if they can get here — get here! — because I can guarantee you four of the best years of your life if you do. This is a place where people smile at each other when they pass. This is a place where you assume that people are your friends until proved otherwise. This is a place where you’re sitting in a room with peers and you realize that you are surrounded by your personal heroes. A while ago, my dad told me that whenever you see professional athletes on the news retiring from the game, they are always crying because they love their job so much. And he told me that’s what you want to do with your life. You want to do something that means so much to you that when it’s over, you cry. Well, for the past four years, my job has been to be a student at Bates. And I loved my job. Every day of it. And I’m gonna go ahead and say that there’s been some crying among the senior class, and a lot of hugging happening. They loved their jobs too. Parents, faculty and staff, isn’t it nice to know that this place and this experience that you have provided for us has affected us so much? Something important has happened to us here. We were educated, and we had the good fortune to live in heaven for four years, and for that, we thank you all. But we don’t live here anymore. And that’s hard. And it’s going to be hard out there, and nobody likes you when you’re 23, but I’m not worried. Because we’re ready. Bates made us ready, and we’re going to carry our Bates education with us wherever we go. We will be intelligent. Because of the ardor and devotion of the good people of this institution. We will be passionate. Because Bates allowed us to follow our passions and realize our dreams. We will be loving. Because the Bates community showed us so much love. And now, we owe it back. We owe it to the world to be as wonderful as Bates has been to us. So now, we thank you, Bates, for everything you have given us. Thank you for the guidance and the good times. Goodbye, for now.